After a 2-hour walk with the My Queenstown Heritage Trail, we were feeling quite hungry – thankfully we ended our trail at Tanglin Halt Market. 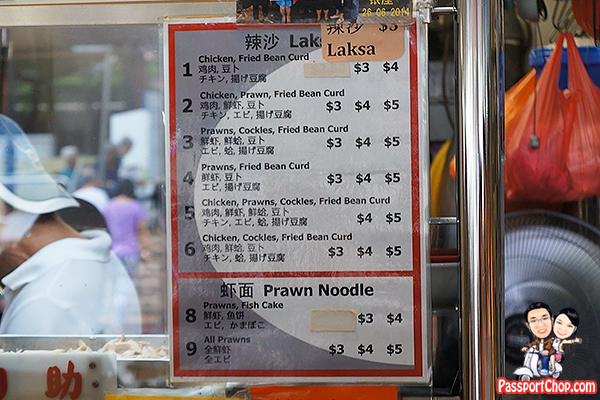 There are 2 stalls with very long queues when we were at Tanglin Halt on Sunday 11.20am – one of them is Wei Yi Laksa and Prawn Noodle (Stall Number 20). The other is Mei Jia Fried Bee Hoon (Stall Number 18) which sells economic rice and of course, fried bee hoon with different ingredients. 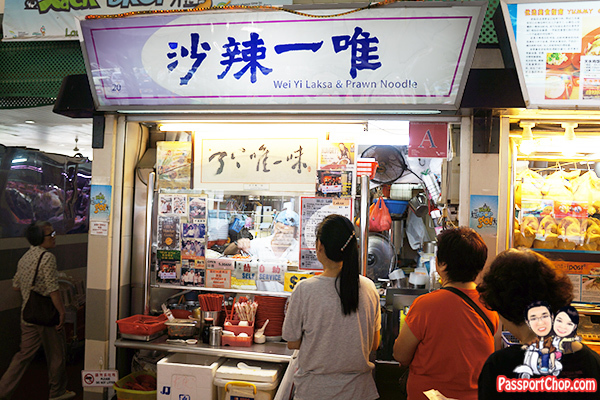 Wei Yi Laksa and Prawn Noodle starts its business at 5.30am and it is closed on Mondays and Fridays. The stall owner works really fast – watching him work is almost like a performance – every action is so smooth from scooping out the rich laksa sauce onto a bowl to stirring to mix up the noodles with the laksa. 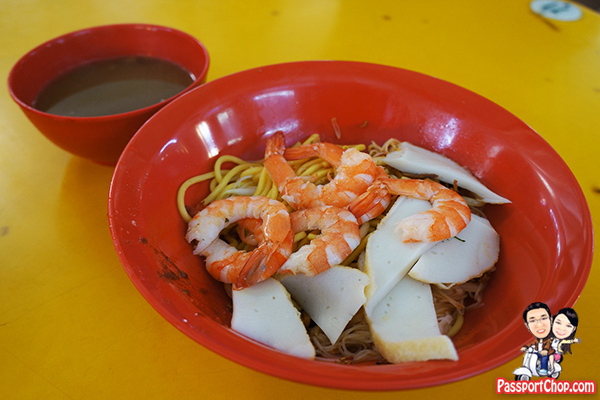 The Tanglin Halt Market Wei Yi Laksa and Prawn Noodle menu is simple – Laksa or Prawn Noodle – you even get to select your choice of ingredients for your laksa. If you don’t like cockles, then just choose the cockle-less options 1, 2 or 4. 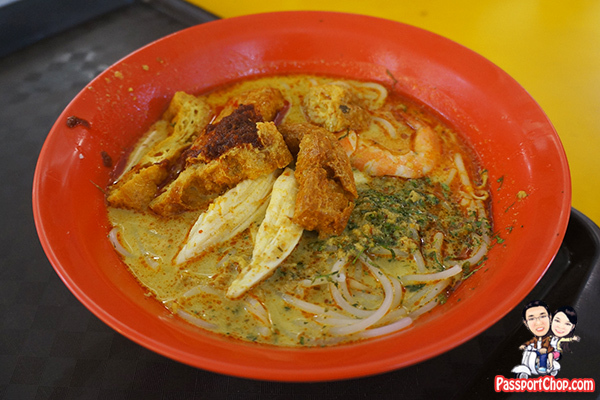 Our $3 bowl of laksa (option 2) – very rich and tasty – worth it! From what i observed (just based on the people who were in front of the queue), 95% of them ordered laksa. Nonetheless, I decided to try the Prawn Noodle too. So here it is – our $3 bowl of prawn noodle (option 8). It is also very tasty – just what i would expect of a good prawn noodle. 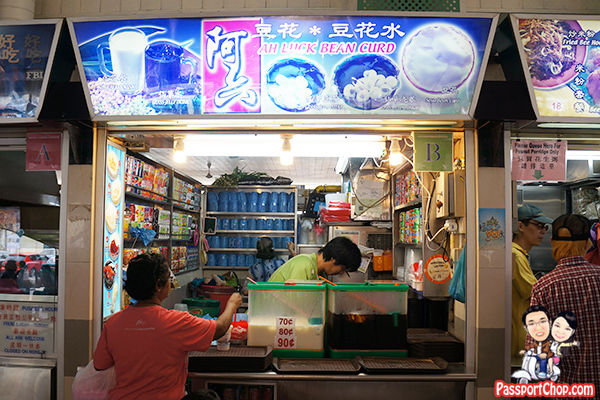 Another stall that comes highly recommended by various forums is Ah Luck Beancurd (Stall Number 17) – located just beside the Mei Wei Fried Bee Hoon. 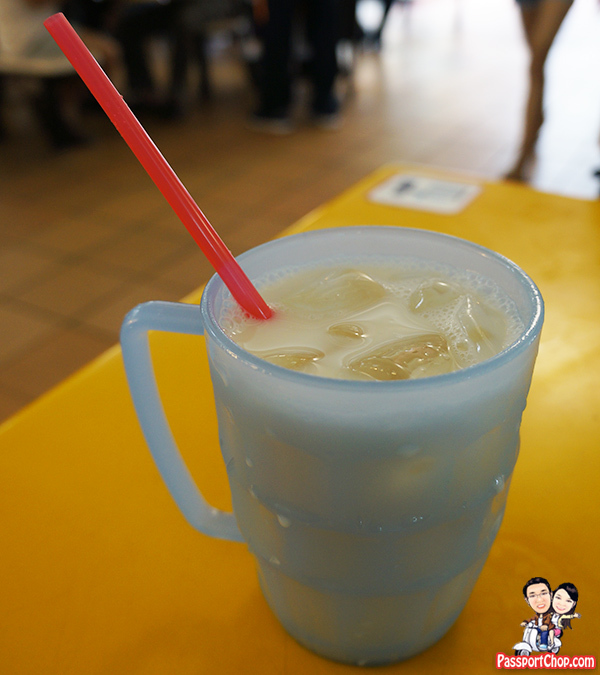 For 80 cents, you get a big cup of refreshing soya bean drink – great drink to cool down after the long My Queenstown Heritage Trail walk. 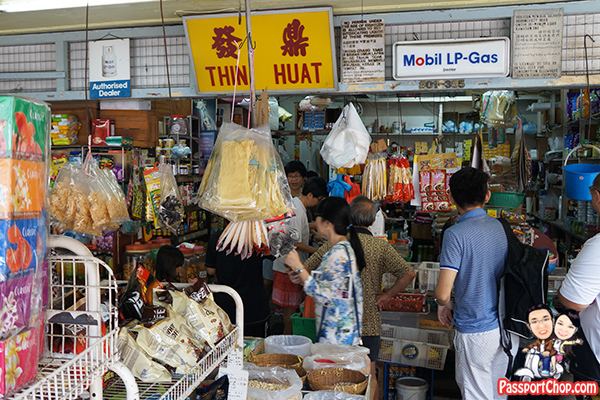 After lunching at Tanglin Halt Market, do walk around the area to check out some very retro shops like this convenience store shown in the picture below. There is also a very old looking clinic in the area. 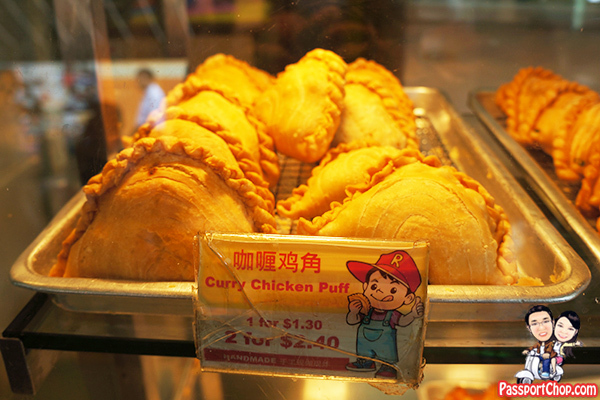 As we were walking towards the Commonwealth MRT station, we spotted this Richie’s Crispy Puff – it was featured in quite a number of newspapers for its unique crispy puff fillings – you can order from the traditional (and best selling) Curry Chicken to Chicken Cheese to even Durian! 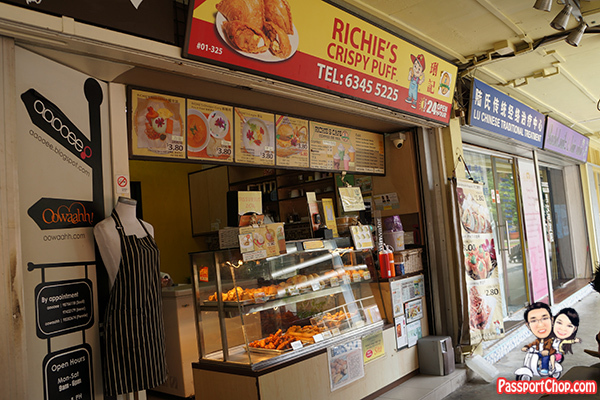 Each Richie’s Crispy Puff cost $1.30 – if you buy two, you get them for $1.20 each (savings of 20 cents!). Very rich filling and crispy on the outside – nice! The nearest MRT to Tanglin Halt Market is Commonwealth – it is about a 5 minutes walk away from the MRT station. The Tanglin Halt market and hawker centre and its surrounding areas are scheduled to be demolished by 2021 as part of HDB’s biggest SERS project to revamp and redevelop this vicinity so do check out the stalls at Tanglin Halt market before it is too late!